The HTC Sensation 4G ($200 with a two-year contract from T-Mobile) pretty much has it all: a dual-core Qualcomm Snapdragon processor, the latest version of Android (Gingerbread), and 4G speeds on T-Mobile's HSPA+ network. When I first played with Sensation 4G, I was blown away by its beautiful hardware, gorgeous display, and slick user interface. After spending a few days with the phone, my opinion of it hasn't changed; but I did run into some troubling issues with its antenna. There has been quite a bit of rumbling about the possibility that the Sensation 4G has "death grip" issues similar to those that plagued the iPhone 4. Sites are reporting that when you hold the Sensation in a certain way, you can lose Wi-Fi, Bluetooth, and 4G connectivity. According to a Swedish Website called Nordic Hardware, the problems occur when you lay the phone flat in the palm of your hand. I decided to take matters into my own hands (no pun intended) and conduct a series of informal tests in which I mimicked the way that the Nordic Hardware folks held the Sensation 4G in this video. 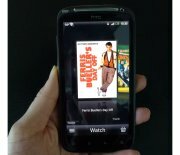 I streamed a movie trailer over 4G from HTC Watch and managed to choke the video three times during playback, though I had to move my hands around quite a bit and grip the phone to kill the 4G signal and send the video into buffer mode. When I performed the same test over Wi-Fi, I couldn't kill the Wi-Fi signal, no matter how hard I tried. I also tested T-Mobile's HSPA+ network in various parts of San Francisco, using the FCC-approved Ookla app. Again, I found that how I held the phone seemed to affect its data speeds. In three tests conducted in the South Park neighborhood of San Francisco, I recorded an average download speed of 1.82 megabits per second and an average upload speed of 0.79 mbps when I held the phone by its edges. But in three tests immediately afterward in the same location, this time with my hand covering the phone's back cover in the "death grip," the phone delivered an average download speed of 0.83 mbps and an average upload speed of 0.64 mbps. These test results suggest that holding the phone in a certain way may have contributed to the observed degradation in data speeds. One caveat: T-Mobile does not have a very strong 4G signal in the South Park neighborhood of San Francisco (where PCWorld's offices are located). When I asked the company about these issues, HTC replied, "Every phone experiences a slight variation in signal strength when the antenna is covered in its entirety by a palm or fingers, however under normal circumstances this does not affect the performance of the phone." I view my test results as worrisome, but not conclusive. We will be conducting more of our own tests over the next few days. Stay tuned for a video and our test results. I love the way HTC unibody phones look and feel, but it's getting hard to distinguish one from another, with their solid gray or black battery covers. Thankfully, HTC has mixed up the color scheme with a tritone paneled battery cover for the Sensation 4G. You'll also feel a change in design when you hold the Sensation 4G. Despite having a 4.3-inch display, the phone doesn't feel oversize. Large phones such as the HTC EVO Shift 4G and the HTC ThunderBolt are wider and more difficult for me to use (I have small hands). The qHD display technology allows the phone to be relatively narrow, so it's easier to hold and use in one hand. Measuring 4.96 by 2.57 by 0.44 inches, the Sensation 4G is quite thin as well. And because the display is slightly concave, it won't get scratched if you place it face down on a table. The Sensation 4G's 4.3-inch Quarter High Definition display has a resolution of 960 by 540 pixels arranged in a 16:9 aspect ratio. That resolution is one-quarter of a full-HD 1080p frame (hence the name), or three-quarters of a 720p frame. The HTC EVO 3D for Sprint, which we saw at CTIA last month, has a qHD display, too, but it uses a parallax barrier to create 3D images. The screen on the Sensation 4G yielded spectacular images: Colors were bright yet not oversaturated, details looked sharp, and animations in the user interface--and native video--played back smoothly. In bright sunlight, however, the display completely fades. Don't phone manufacturers know that people need to use their phones outdoors sometimes? I had a very hard time finding a phone number to let some friends know that I was outside their apartment. You'll find the usual touch-sensitive buttons below the display: Home, Menu, Back, and Search. The headphone jack and the power/lock button sit at the top of the phone. A very long chrome volume rocker occupies the left spine, with the micro-USB port situated below it. The left spine and the bottom of the phone are bare. Note that there is no HDMI port or MHL port for connecting the Sensation 4G to your HDTV. Like the EVO 3D, the Sensation 4G sports the latest version of the Sense user interface, with Android 2.3 (Gingerbread) running underneath. Sense is the prettiest of the Android overlays, and the latest version has some sweet features. One of these features is a new customizable lock screen, which works similarly to the newly announced lock screen in iOS 5. You can pick a theme for your lock screen (the phone offers quite a few of them to choose from) and then select four apps that you visit most frequently. When you turn on your phone, you'll see the four apps at the bottom of the screen. To unlock the screen, simply drag the circle into position over an app, at which point you'll jump straight to that app. Thanks to this feature, you don't have to go through multiple menus to reach your e-mail or other frequently accessed items. The new version of Sense has a spruced-up Walls system, too. Rather than having to flick back and forth between your walls, as you do in the stock Android operating system, you can flick the Sensation 4G's screen to make the walls spin. The effect is reminiscent of a rotating carousel. And like the older version of Sense, you can pinch anywhere in your homescreen to see thumbnail-size images of your walls. You'll find a clutch of new widgets in Sense, but my favorite is the gorgeous new Weather widget. HTC has a solid tradition of creating visual weather apps, and it's nice to see the company continue to improve them. The Sensation 4G also comes loaded with HTC's new movie and TV show streaming service, Watch. You can download videos from Watch and start viewing them immediately. Watch is well integrated into Sense, so finding the videos that you want to view is easy. The app's interface is clean, and movies are easy to find, but the library is pretty sparse at this point. You'll find some newly released movies like Due Date and some classics like Top Gun. If you're looking for something in particular, though, you're not likely to find it (no Spinal Tap!). A few popular TV shows like Chuck and Gossip Girl show up, but you're limited to one or two seasons of episodes. On the plus side, video from Watch played back smoothly and looked great on the Sensation 4G's display. Audio accompanying the video sounded crisp and clear when piped through the Sensation's external speakers, with ample volume. Unfortunately, the Netflix Android app is not yet available for the Sensation 4G. Watch has potential, but HTC needs to add more content to keep customers happy. Like the EVO 3D and the ThunderBolt, the Sensation has a back-facing 8-megapixel camera and a front-facing camera for video chat. HTC says that it has tweaked both the hardware and the software to improve the back-facing camera's shutter speed. I noticed and appreciated the quicker speed in my hands-on tests. It doesn't matter how good a camera's image quality is if the device suffers from shutter lag, since the delay makes snapping photos of people or animals incredibly difficult. overall, I was very pleased with how the snapshots turned out. Photos taken indoors also looked pretty good. There was a bit of a dark cast to the colors, but details were fairly sharp, even when the photo was blown up. The flash does a decent job of lighting up photos without completely blowing them out (except for whites, as evidenced by the middle Furby's chest in the test photo above). You can shoot video in 1080p thanks to the dual-core processor, but I was disappointed with its overall quality. Playback was choppy, and the colors had a strange cast to them. Call quality over T-Mobile's network was fairly good. A few of my friends reported that my voice sounded somewhat muffled. One reported that the background noise (traffic and wind) was quite distracting during our call. Thanks to the dual-core Snapdragon processor, the Sensation 4G handled every app I threw at it perfectly. Angry Birds Rio played smoothly and looked terrific on the phone's lovely display. Even when I had multiple apps open, the Sensation 4G did not seem to slow down. We haven't had a chance to formally test this HTC phone's battery life. Its 1,520mAh lithium ion battery has a vendor-rated talk time of 8.3 hours and up to 12 days of standby time. My unit went a full day of heavy testing before I had to recharge it. If you're in the market for a new phone this summer, you face a tough decision: There are a lot of hot phones available. Hey, that's not a bad thing at all! The Sensation 4G has some impressive specs and a gorgeous design, and I love the new updates in the Sense user interface. The phone's possible antenna issues are disturbing. As we learned from the Apple iPhone 4 fiasco, trying to avoid holding a phone in a certain way is not a reasonable limitation to impose on users. And though I had to try to kill the Sensation 4G's signal, I succeeded in doing it. We'll be doing more testing in coming days. For now, I recommend the HTC Sensation 4G, but you should be aware that antenna problems could interfere with your data speed. The Sensation delights with a gorgeous display, a beautiful design, and dual-core power, but possible “death grip” issues are worrisome.